des moines // summer slowdown. the last full month of summer. the month I turn one year older wiser [my ‘golden’ birthday, to be precise]. one month closer to [J] & I’s impending nuptials. the month of my first dress fitting & first bridal shower. that happened fast. I have been diligently working down my summer bucket list. and I’m scratching quite a few off the list, but I still have work to do. here’s a bit of what I’ve been up to ..
dined [twice] at malo. neither times al fresco though. oops. attended + loved zoo brew with [J] + his dad. went to the farmer’s market [the breakfast burritos aren’t there anymore .. I don’t want to talk about it]. but my mom got the largest bouquet of flowers. and last weekend, [J] + I FINALLY got our engagement photos taken. the whole experience was amazing. [I cannot wait to share]. hope you’ve been busy enjoying summer & crossing stuff of your bucket list. football season fall will be here before we know it. and in honor of my favorite season, I created a bucket list ..or rather a to do list, to make the most of fall. can I add one? win a fantasy football game, at least one. before you know it, it’ll be winter. where the heck has summer gone? it feels like it just began. and we’re already somehow in mid-july. are you making the most of your summer? it could be said, I am not. 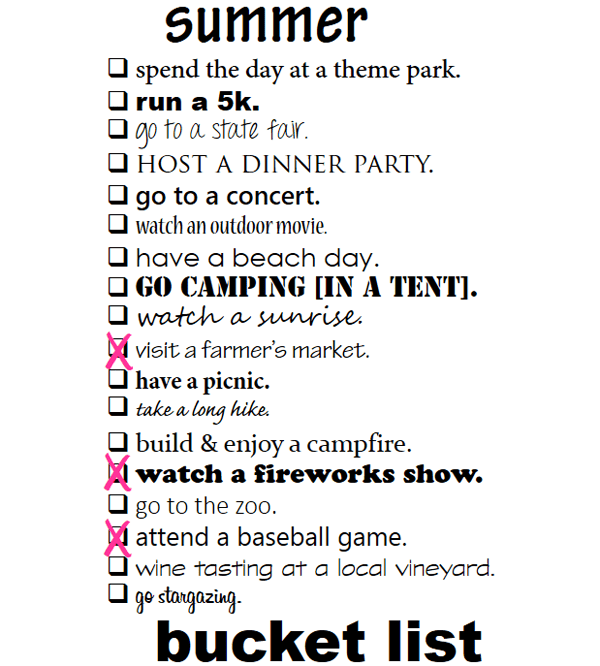 my summer bucket list, thus far .. I may be relying heavily on my two-week excursion to cross off a large chunk of these items. and I do have plans to attend the iowa state fair when we return. how is your summer bucket list going? please say better than mine. my goal is to have every single item crossed off by september 1st. [I’ll be busy prepping camping food, packing my suitcase, & purchasing outdoor gear all day. t-minus 3 days].